This is Baby, one of my goats. She is a Boer/Nubian cross. Boers are raised as meat goats, while Nubians are dairy. 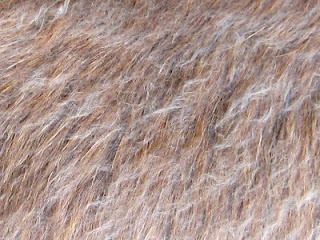 Spinners know that goat fiber comes from angoras, pygoras (angora/pygmy cross), or cashmere goats. But a goat like Baby??? Here's what I discovered about Baby. Earlier this month she started growing a down coat. Neither of my pure blooded Nubians are growing one, so I'm guessing this is the Boer genes in her. This was the mystery fiber, which I hand plucked, just a little bit because I was so curious about it. She didn't have it when I first got her last May, so I'm guessing she'll shed it sometime in the spring. I will have to try to comb it out then and spin it. I'm very curious about what kind of yarn it will make! Boer goats have more than a bit of cashmere blood in them - and some of them are worth combing for it. Looks like you have a bonus fiber animal! Bettina, it's funny isn't it. All I got her for was a brush goat. No pun intended, she is supposed to eat brush LOL. Laura, thanks for that tidbit. I didn't know that about Boers. No wonder. I'll just have to wait and see about quality. I'm very curious about it though. Can't wait to see the spinning results. 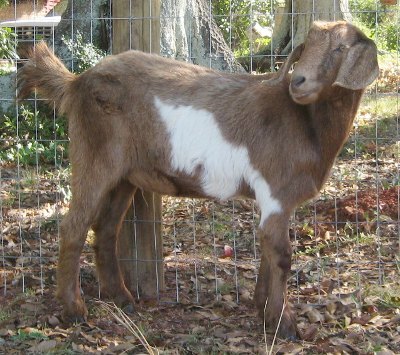 I bought a Nigora goat this summer. She is soooo soft! I am looking forward to spinning her wool next spring.